Waterlooville Allstars are charging towards promotion from Portsmouth & District League division two. They stretched the advantage to 10 points over Copnor D at the top, writes Graham Simper. A dominant performance saw them earn a 10-2 victory against their D team. Their top four cueists belong in the top flight and it showed again. Colin Norton rolled in breaks of 39, 34 and 30. Mark Lloyd made a 37. Pascal Richard and James Budd also impressed as the table toppers made the game look easy. Wayne Rendle knocked in a 53 to add to a Lee Rendle double but Copnor only managed a draw at Pompey Royals. Paul Chivers and Paul Tinsley kept the pressure on throughout for the Stationsiders. Cowplain Gas looked doomed at Waterlooville C as they trailed 5-1 after Rob Derry and Gary Wilton got going. 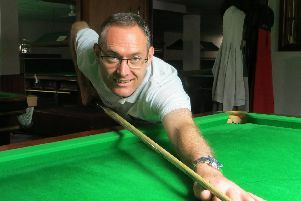 However, Terry Lees, Gary Churchill and Neil Kirby won the next six frames for a remarkable 7-5 win. Copnor E drew with North End Bowls. Ian Pledge and Mike Dorey gave the visitors the lead, then Phil Ledington and John Oldfield hit back. Bellair stopped the Craneswater A gallop with a hard-fought 6-6 draw. Greg Jones and Paul Jagger both grabbed a brace for the Havant outfit. But Tony May battled to a draw despite Rob Kirby running in a break of 58. Stuart Calver and Andy Boulton were the pick for the home side. Copnor A woke up to stun Craneswater Z 11-1 to move clear of the drop zone. Kevin Harding and Ant Lacey set the tone at 4-0. 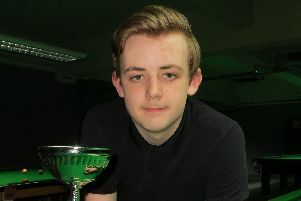 Mark Jones held Dan Compton to stop a maximum, then Mark Tillison, Lee Eden and Steve Toms, with a 32 break, polished the rest off. Waterlooville A cut the deficit in second place to five points after a 9-3 success against Craneswater R who are well adrift at the bottom. Richie Burnett, Phil Watson and Aaron Smith put their previous defeat behind them. Heath Smith, Dave Rees and skipper Dave Parsons were on target as Cowplain Z beat Craneswater Q 9-3. Portchester X kept it tight against visiting Emsworth in the later stages after early doubles by Greg Harding and Nick Fegan. Waterlooville B recorded an emphatic 11-1 win at Cowplain Misfits. They moved up alongside Al’s Club in division three. Keith Neil and Colin Johnson won the opening four racks and it was soon 8-0. Duncan Campbell prevented the whitewash, then Nathan Hickley won the next two. Paul Ashmore and Andy Howell got Al’s Club over the line with a 7-5 win after Sam Laxton registered breaks of 45 and 33 to give Copnor Xcels a 5-3 advantage. Cowplain B were also tested at Alexandra Bowls before getting a win in the last two frames thanks to Gary Curtis. Paul Taylor and Dave Harfield were on song for the bowlers and Pete Gorvin and James Curtis responded with doubles. Shaun Croxford shone for the Butler Boys with a run of 57 against Broadoak. However, the damage was done earlier as Gerry Wheeler, Simon Fleming and Chad Wainwright had set the standard for an 8-4. Dave Riddell put Leigh Park ahead with a visit of 39. But Mel Davis gave Craneswater Dandy parity with two on the other table. The next six were shared before Ian Fleming gave Leigh Park the 7-5 victory.